As spring rolls around, we still see cool weather vegetables in the markets. Root vegetables, like sweet potatoes and carrots, and brassicas including cabbages, Brussels sprouts, and kale, line farmers market tables. These vegetables often lend themselves to heavier preparations, such as roasting or gratins. But as the sun shines brighter, I want our meals to feel lighter too! So, instead of roasting vegetables for every meal, I tend to start sautéing more. Rather than using warm spices, I tend to gravitate towards fresh herbs and citrus to flavor my side dishes. Brussels sprouts are absolutely delicious when roasted in butter and flavored with garlic, but have you ever tried them lightly sautéed? 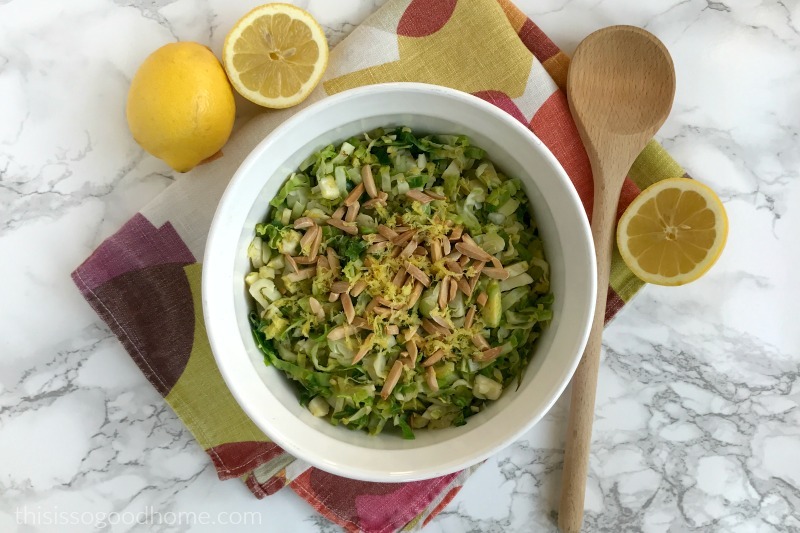 Today’s recipe for Shaved Brussels Sprouts with Lemon and Toasted Almonds is the perfect way to try this method. Often, the main dish gets the most attention at any meal, but have you ever tried making a really tasty side dish and a fairly simple main? I love doing this because it’s a huge time saver. You still get tons of flavor but don’t need to spend time prepping and seasoning meat or fish. Just throw a little salt and pepper on you main and punch up the flavor with a great side! 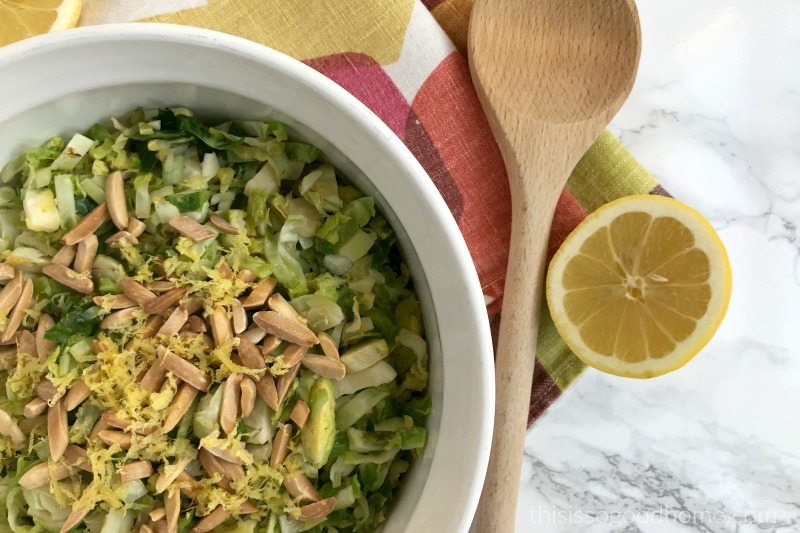 These Shaved Brussels Sprouts with Lemon and Toasted Almonds are a tasty match for baked fish, grilled chicken, steaks, and even burgers. They have a fresh, light flavor from the lemon and a salty kick from the coconut aminos. 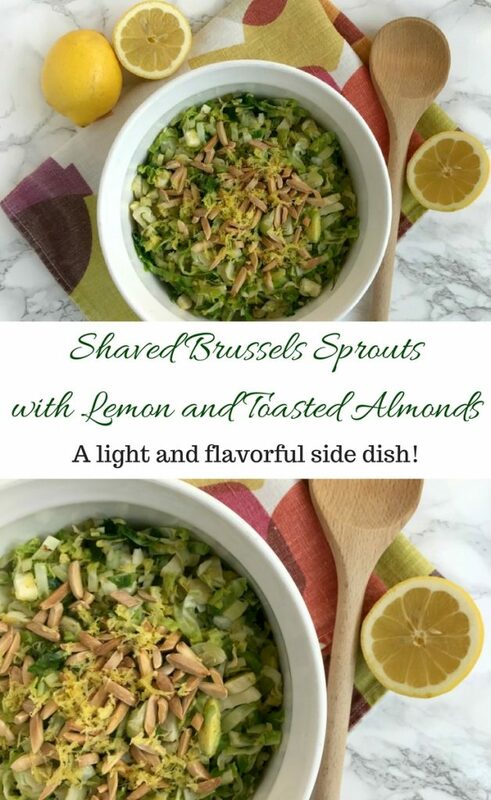 The Brussels sprouts retain a little crunch when sautéed and the toasted almonds up the game just a bit more! This side dish comes together in no time at all. Make use of those kitchen appliances and shred the Brussels sprouts in your food processor or on a mandoline. Of course, a sharp knife will work just as well! Toast the almonds while sautéing the Brussels sprouts and you will have a delicious side in about 15 minutes. Do you love a flavorful side dish? Don’t miss out on some of our other favorites: Turmeric Roasted Carrots, Simple Oven-Roasted Radishes, Garlic Roasted Green Beans, and Citrus and Thyme Roasted Carrots. Heat the avocado oil in a large skillet over medium-high heat. Add the garlic and the shaved Brussels sprouts and sauté for 3-4 minutes or until just starting to soften. Add the lemon juice and coconut aminos to the pan and continue to sauté for another 1-2 minutes. Transfer the Brussels sprouts to your serving dish and top with slivered almonds and lemon zest.